After a hard-fought beginning to the 2015 Colm Quinn BMW Galway International Rally, Donagh Kelly and Ken Flanagan took an emphatic victory aboard their Ford Focus WRC, 39 seconds ahead of the BMW MINI of Eugene Donnelly and Paul Kiely. Powering into the lead on the fourth stage, the Donegal pairing were never headed en route to their maiden International rally win. The excitement and anticipation for the first major rally of the year was building in Galway ahead of the start, with the announcement of a two car team from Colm Quinn BMW. 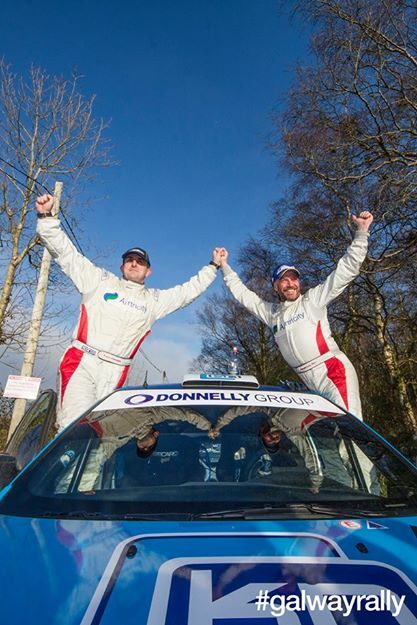 The event sponsor renewed his relationship of the previous three years with Donnelly, in addition to taking on Irish Young Rally Driver of the Year, NUI Galway graduate Dean Raftery. In a deal agreed at the rally press launch just three weeks before the event, Raftery made his Galway debut in the second BMW MINI, his first event with WRC power. Early reports from spectators on the first stage, Skehanagh in South Galway, had the Craughwell man fastest of all entries. Unfortunately, a waterpipe on his car worked loose. The subsequent time loss and road penalties incurred in making running repairs dropped the talented driver down the order. He would recover to finish a solid sixth, with several top stage times in the process. Another driver to hit trouble at the beginning of the event was former Irish Tarmac Champion, Garry Jennings, who crashed out of second overall on the fifth stage. The early pace-setters were the defending Irish Tarmac and Galway champions, Donegal cousins, Declan and Brian Boyle. Their Subaru WRC worked perfectly in the high-speed tests around Gort, despite their report of it being “slippery under braking”. The pair’s blistering pace saw them win the opening stage. Despite their lead being cut to 5.6 seconds by Kelly in the following Cappacasheen test, they looked set to defend their Galway crown in fine fashion. However, it would all go wrong for the duo in the mid-afternoon. Their engine was reluctant to start at the beginning of the third stage, and the resulting lateness meant three minutes of penalties. After their storming start, the Boyles tumbled to fifth on the leaderboard – a disappointing position for the dominant winners of 2014. Capitalising on their misfortune was Kelly, runner-up to the cousins in 2014. Despite the best efforts of those behind him, he set a lightning pace through the fast Saturday stages, building up a cushion of 38 seconds by the evening service. Behind him, five times Irish Tarmac Champion Donnelly wasn’t giving up on a Galway victory in his BMW MINI after three years of trying. The twisty Sunday stages were better suited to his lesser-powered 1.6 litre engine, and he was intent on hunting down the crew ahead of him. The infamous Black Road test first thing in the morning changed his tune. Emerging from the stage with the comment that “it was unpredictable and knocks the confidence”, he lost second-place to the charging Sam Moffett by half a second. The championship front-runner’s Fiesta WRC has similar power to the BMW MINI, and the two were evenly matched throughout the final day. With the cancellation of the day’s second stage on safety grounds due to fog, Donnelly was running out of miles to chase down the Boyles, and instead switched his focus to fighting off Sam Moffett for the runners-up spot. The duel was a sing-song one over the final stages, with first Donnelly and then Moffett seizing the upper hand. But when Lough Cutra cleared of fog, Donnelly capitalised, despite the “inconsistent” grip, taking five seconds out of the young Monaghan man over a five-minute stage to reclaim second. Eventually, it all came down to that stage’s final running, the closing test of the rally. Going into it Moffett held a relatively large 3.6 second lead, given the brevity of the test. But Donnelly had a good feeling on the lakeside roads and stormed through to beat Moffett by almost five seconds again! After two days of rallying, Eugene the ‘Genie’ finally took second place by a mere 0.7 of a second. Pleased at the finish, Donnelly thanked sponsor Colm Quinn for the opportunity to compete between the Galway stone walls. It was a sentiment echoed by Dean Raftery, who survived a scary off in his sister car to finish sixth overall. Behind the leading trio, Sam Moffett’s younger brother, Josh, bedded himself in aboard his new Fiesta WRC and finished fourth, with the misfortunate Boyles salvaging championship points in fifth. But the event belonged to the jubilant Donagh Kelly, who finally climbed the top step of the podium after two years of trying. With his pace ever-increasing, he looks set to be a serious challenger to the Boyles’ title defence.